All Roboteq controllers are high performance, microcontroller-based motor controllers, loaded with numerous features and operating modes. Yet, for all their sophistication, the controllers are very simple to install and operate. Their many configuration options are programmed using PC utility with a convenient Graphical User Interface. Once programmed, the configuration data are stored permanently in the controllers' nonvolatile memory, eliminating the need for cumbersome and unreliable jumpers. The Roboteq controllers are fitted with many safety features ensuring a secure power-on start, automatic stop in case of command loss, overcurrent protection, and overheat protection. Temperature sensors automatically adjusts the Amps limit in case of overheating. 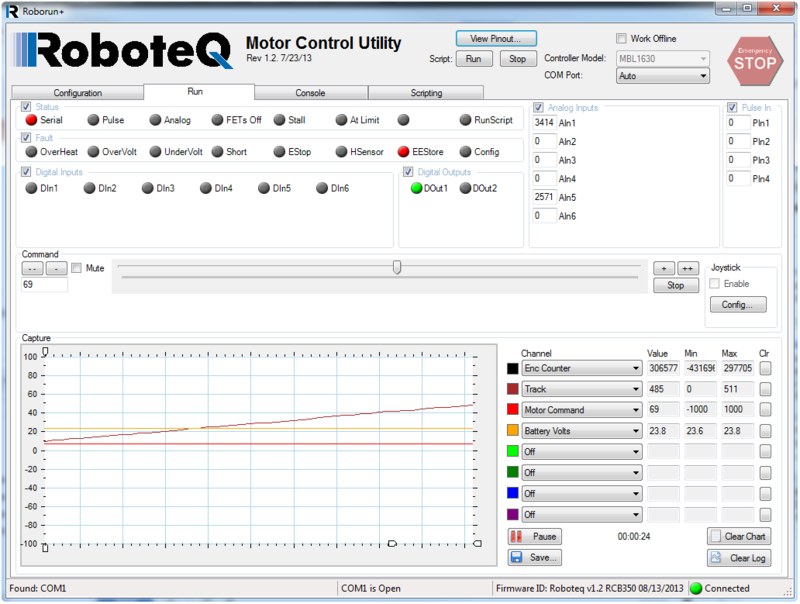 This 14 minutes video demonstrates many of Roboteq's advanced features and how to use the PC utility to configure, operate and manage the controllers. The controllers’ multiple command input modes - USB, Pulse, Serial Port, Analog or CANbus - make them uniquely interfaceable to all types of PLCs, microcontrollers, remote control radios, or other command devices. These modes are described in more details in the connectivity page. Roboteq is one of the few suppliers of high-power dual channel motor controllers. All Dual channel products can also be ordered in Single Channel versions. The Single Channel controllers are identical to the Dual Channel except that the output transistors of both channels are perfectly synchronized and thus allow the motor output leads to be wired in parallel and thus drive twice the amps into a single load. In this mode, the controller delivers an amount of power proportional to the command information. The actual motor speed is not measured. In this mode, optical encoder or an analog tachometer is used to measure the actual motor speed. In brushless motor controllers, the motor's hall sensor can be used to measure speed. If the speed changes because of changes in load, the controller automatically compensates the power output. This mode is preferred in precision motor control. Position Relative - This mode uses analog, encoder, hall sensors or pulse feedback sensor with a scalled range of -1000 to +1000 and the motor will move from the current position to the destination using a controlled acceleration, velocity and deceleration. Count Position - This mode is similar to Position Relative but the full counts of the encoders or the hall sensors for position feedback. The motor can be made to go to any count position value using a controlled acceleration and velocity profile. Position Tracking - This mode is similar to the Positon Relative but with just a PID. The motor will try to go to the desires destination as fast as possible. In this mode, controller will adjust the output in order to reach and maintain a set current value. Dual Channel controllers may be connected to two motors which will react to commands received on two input channels. Using these two channel inputs, the motors can be commanded independently or in a combined fashion to accommodate the most common drive and steering methods in robotic vehicles. In this mode, each of the two motors is commanded independently of the other. This operating mode is best suited for generic motor control applications. In this mode, the motors work in combination to move and turn a vehicle by combining the forward/reverse command information and the left/right steering information. This mode of operation provides a cost effective method for moving and steering tank-style robots and underwater vehicles. The latest generation of Roboteq controllers incorporate a simple but very fast and powerful scripting language, allowing new function to easily be added by the user. The feature is fully described in the MicroBasic page. High efficiency MOSFET “H-Bridges” are used for full forward and reverse operation. The controller uses Pulse Width Modulation at 18kHz to generate smooth, variable output power in as little as 0.1% increments. This parameter refers to the conductivity of the MOSFET transistors when they are turned on. A low "On" value results in less heat generated by the transistors for a given current flow. It is the principal metric for comparing the efficiency - and real power handling capability - of one controller type over another. The power generated inside the transistors is computed using the formula P = I x I x R. The published "On" resistance on all Roboteq web pages and documents is the the total resistance that is between the motor leads and the battery. A sensor measures the actual current delivered to the motors and automatically reduces the power if the current goes over the preset limits during extended periods of time. Temperature sensors located on each heatsink will cause the controller to adjust the maximum allowed Amps in case of controller overheat. This feature eliminates the need for oversizing the controller and allows the controllers to perform as better than products without current limitation. The controllers can also be configured to automatically “smooth” command changes (from stop to full speed, for example) to avoid sudden overloads on the controller, the batteries and/or the robot’s mechanical components. The controller’s programmable acceleration feature will automatically limit abrupt speed changes to preset user values. Acceleration and Deceleration rate can be set separately on Roboteq's most recent products. All Roboteq controllers monitor the battery voltage and will shut off the power stage when unsafe conditions are present. This feature is particularly useful during rapid decelerations as the regenerated current that is trying to flow back to the battery, may cause the voltage to rise to dangerous levels in certain conditions. This technique uses actively commanded MOSFETs, instead of diodes, to route the reverse current that flows back from an inductive load (such as a motor) as it is switched off during the Pulse Width Modulation cycles. Practically, this results in higher power efficiency and very direct control of speed, particularly during deceleration thanks to a braking effect. Synchronous Rectification also allows regeneration into the battery during deceleration. All Roboteq controllers, include a DC/DC converter that will generate all internal voltages for the microcomputer, logic and motor drivers, from the main 10 to +60V (depending on models). As a result, the controller will turn On as soon as its Battery Wires are connected to the battery. In order to turn On and Off the controller without the need for a bulky and expensive switch or relay on the high current wires, the controllers use a Power Control wire to enable or disable the internal DC/DC converter. The Power Control wire can also be used to feed a stable supply to the controller so that it will continue to operate if and when the main batteries’ voltage dips below the undervoltage limit. All Roboteq controllers feature power connectors or wires properly sized to the current handling of a given model. All Roboteq controllers feature alluminum heat sink for dissipating the heat generated inside the power MOSFETs. Open-frame models use an aluminum heatsink located under the board or an optional bottom plate for conduction cooling. Enclosed model versions are mounted inside an aluminum extrusion that serves as a heatsink. Digital Inputs which may be used for emergency stop, invert direction, limit switch, etc. 1A solid-state switched output(s) for controlling a brake, clutch, weapon, field excitation relay or other device. A regulated 5V supply output for powering an R/C radio (Battery Eliminator Circuit), potentiomenters, encoders or other sensors. Often, an input can be used as Analog, Digital or RC input. Details of quantity, types and possible use is shown in the product datasheet. Using the PC and an internet connection, it is also possible to download and install software updates to the controller in order to improve existing features or enable new ones as they become available. This unique capability keeps the controllers from ever becoming obsolete. Updating the controller with the latest software is a very simple and quick point-and-click procedure requiring no special computer or electronics skill. Upon request, Roboteq can also perform custom modifications to the embedded software to meet specific user’s requirements.